Matt Wantman was all in preflop with [7s][7d] against Marty Gorenc's [Ah][Jc]. The [Qd][Jh][Kc] flop favored Marty, and Matt would need a seven to survive. 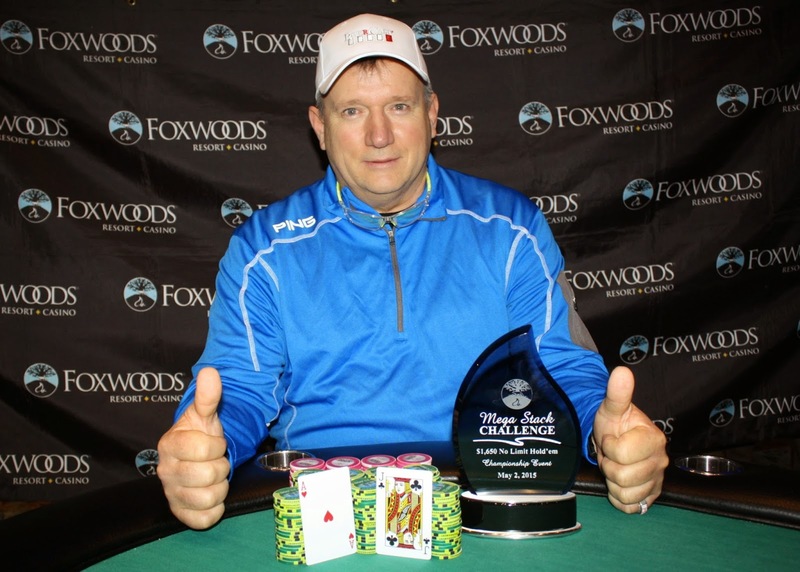 The [Ks] turn changed nothing, and the [8s] meant Marty Gorenc has won Event #10 $1,650 Championship. He will collect $45,311, the title, and the trophy. Congratulations, Marty! At the top of the level, Marty Gorenc and Matt Wantman were nearly even in chips. In the last half hour, Marty grinded Matt down to just over a million, and Matt got those chips in preflop against Marty. Matt had the advantage with [Th][Td] against Marty's [4h][4d]. There were no shenanigans as the board ran out [9c][3s][Jd][2c][7d], doubling up Matt to 2,340,000. For most of Level 28, we have seen Marty Gorenc and Matt Wantman battle back and forth. There hasn't been an all in yet. The players have decided to lower the blind levels to 30 minutes after this level. 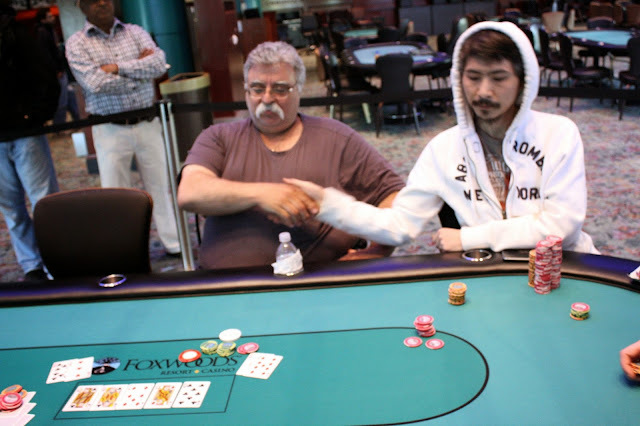 On a [8d][7d][Js] flop, Je Wook Oh was all in with [6d][3d] and was up against Marty Gorenc's [Qh][Jh]. Je Wook would need a diamond or running cards to survive, but the turn fell the [Ac]. The river landed the [7s], keeping Marty's hand in front. Je Wook will exit this tournament in 3rd place, good for $38,500. The final 3 players have agreed to a deal. The three players are taking the following prize money, and playing for the trophy and an additional $4,817 in prize money. Ralph Massey was all in preflop holding [Jh][Jc] and was flipping with Marty Gorenc's [Ad][Kd]. The [5h][Ks][3h] flop put Marty in the lead, and Ralph would need a jack to survive. The [Kc] changed nothing, and the [Th] river meant Ralph Massey would be our 4th place finisher. He will take home $20,777 for his efforts. 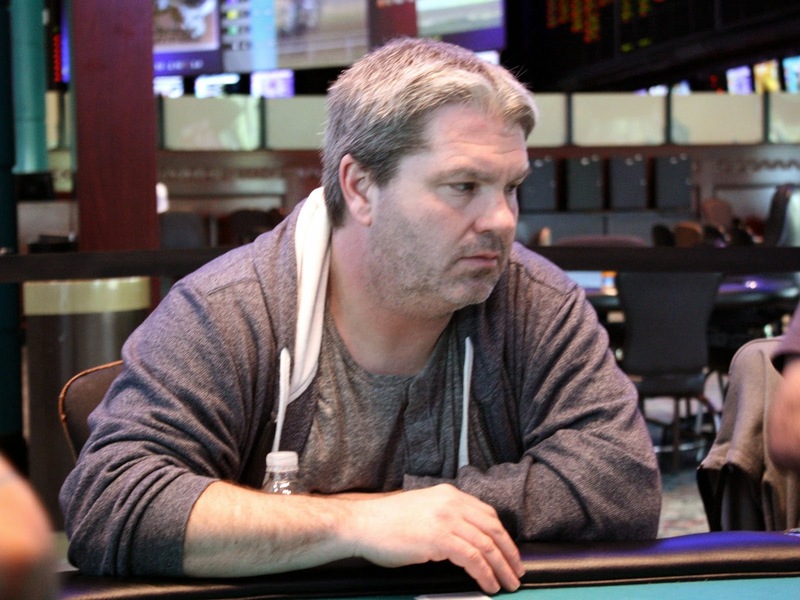 At 12,000/24,000 blinds with a 4,000 ante, Ralph Massey opened from under the gun to 52,000. On his left, Marty Gorenc 3-bet to 125,000, and action folded back to Ralph. After asking how much Marty started the hand with, Ralph moved all in and Marty snap-called. Ralph would need to catch a jack to knock Marty out in 4th place. The [9d][9c][Th] flop gave Ralph some chop outs, and the [Qh] on the turn meant he could only catch an eight or a king to win the pot. The river was a blank, and Marty's top two pair was enough to double up. His stack was counted down, and Marty had 679,000 total, meaning he will double up to over 1,300,000. Meanwhile, Ralph is knocked down to 360,000. Dominik was making a move and would need to get lucky, but he did have two live cards. The [Jc][Qc][7d][Jd][8c] board brought him no help, though, so he will exit the tournament in 5th place. Dominik collects $15,831 for his efforts today. Kevin Lynch was all in preflop holding [Ks][Kc] and was up against the [As][7s] of Ralph Massey. The [8h][Td][Ts] flop was safe for Kevin, but the [Ac] turn spelled disaster for him. Kevin would need one of the two remaining kings on the river to survive, but the dealer placed the [Th] on the river to give Ralph the winning hand of tens full of aces. Kevin will exit this tournament in 6th place, good for $12,862. 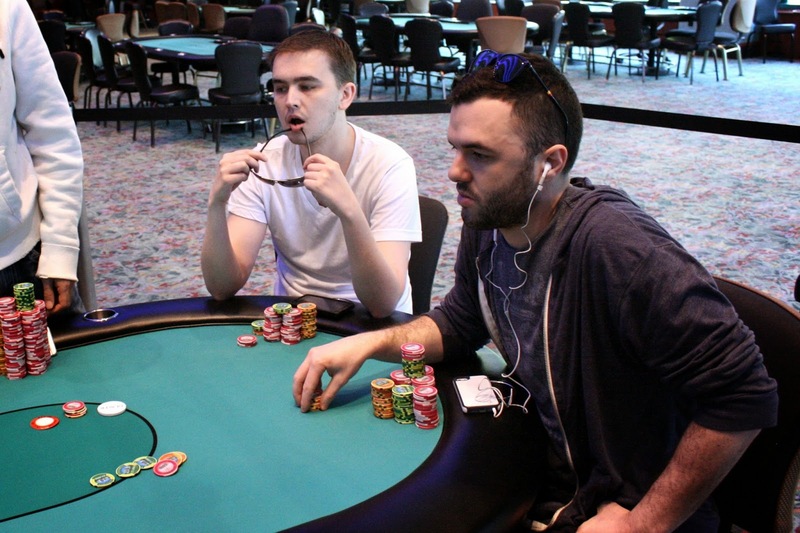 Jonathan Lewis was all in preflop with [2s][2d] and was up against Matt Wantman's [Ah][Jc]. The [Qc][Js][Kc] flop left Jonathan in bad shape, and the [6c] turn left him one step closer to elimination. The [9c] river meant the pair of jacks would be the best hand, and Jonathan Lewis will exit this tournament in 7th place. He will collect $10,389 for his efforts. On a [8h][4h][Ac] flop, Peter Everett was all in against Je Wook Oh. Peter had top pair with his [Ad][Jc], but was outflopped by Je Wook's [As][4s]. Looking for a jack, the turn came the [2s] and the river the [3d], eliminating Peter in 8th place. He will collect $8,409 for his efforts. Dominik Pelli was all in preflop holding [8s][8c] and was in bad shape against Peter Everett's [Td][Tc]. The [Qc][8h][4h] flop turned the tables, almost guaranteeing Dominik a doubleup. The [5s] turn changed nothing, and now Dominik was hoping it wouldn't be another bad river at this final table. The [Ah] landed on the river, giving Dominik the doubleup. He now sits on over 300,000. On a [3d][5s][9s] flop, Welther Marmol got the last of his chips in holding [9c][6h] against his opponent's [Ac][4c]. Welther's top pair held on the [Tc], but the [Ah] on the river was another bad river for Welther. He will exit this tournament in 9th place, good for $6,685. 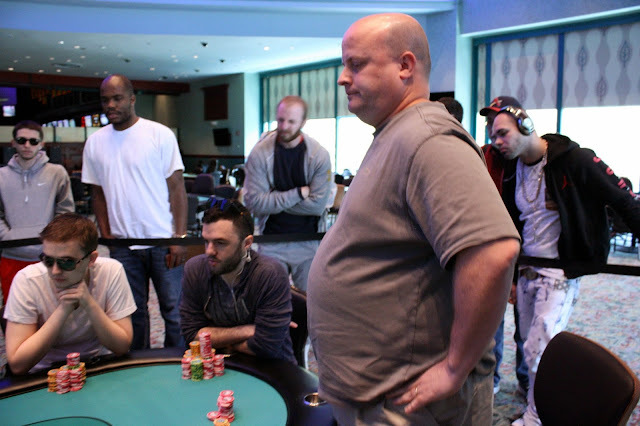 Our first all in of the day came with Marty Gorenc getting his chips in with [Ah][Ad] against the [Jh][Jc] of Welther Marmol. The [Kh][Jd][Td] was a disaster flop for Marty, as he was outflopped and was now drawing to six outs. The [2c] turn changed nothing, but the [Ac] river delivered some poker justice. The best hand preflop held up, and Marty will double up to over 900,000. Players start with 30,000 in non-value tournament chips. Re-Entries are available through the end of registration. Registration will remain open through the end of the 9th level. Levels 1 - 25 will be played for 20 minutes. Levels 26 & UP will be played for 30 minutes. Play will end after level 22 or Final Table which ever comes first. Day 3 will start at Noon and will be played to completion.